SageMath is an open-source, general purpose mathematical software system that is free to use for private, commercial, and governmental use. Sage is built on top of Python, an object-oriented computer language that is popular in the scientific computing and engineering communities, as well as industry. By incorporating a variety of open-source software, such as R (statistical software) and Singular (symbolic computation), SageMath is a powerful computer package for many areas of mathematics and for scientific applications. Because of its open-source nature, the software also utilizes an open development model where students and researchers from many different areas of mathematics can (a) examine source code so that it is possible to understand how each calculation is done and (b) become involved as users and developers as part of the Sage community. Visitors will receive office space in Lind Hall, access to the computing network, and additional technical support as needed. See list of completed coding sprints. The goal of this year-long program is to continue expanding the developer base of SageMath while fostering connections between mathematics and industry. William Stein University of Washington and SageMath, Inc. 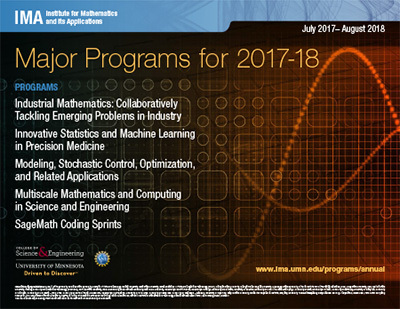 Applicants should then complete a short online application and email a 1-2 page proposal to coding-sprints@ima.umn.edu. The proposal should include a description of the design proposals for any code to be written and how the potential functions of the code or materials to be developed will impact researchers in academia and industry and/or educators. Proposals should discuss prior history of related code in SageMath, or other open-source software, and a brief description of the relevant mathematical and coding background of the proposers.